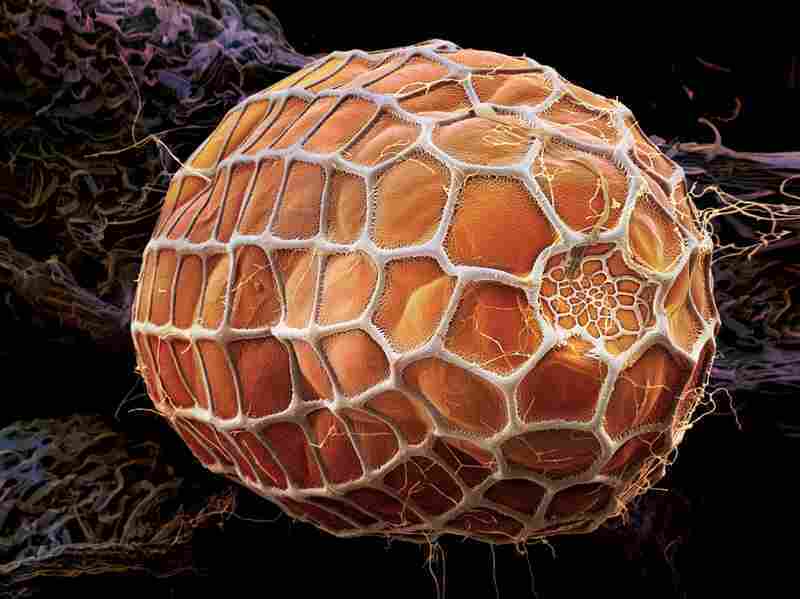 The Beauty Of Bug Eggs : The Picture Show When viewed close-up, even nature's nastiest things can look beautiful. Martin Oeggerli, aka Micronaut, is at it again. He has this knack for finding beauty in things that should be totally disgusting. In things that are really small. Like grains of pollen. Or, even worse, insect eggs. His photos, along with a gross but entertaining story, are in National Geographic's September issue. The egg of a Julia heliconian butterfly rests on the tendril of a Passiflora plant. This species lays its eggs almost exclusively on this plant. 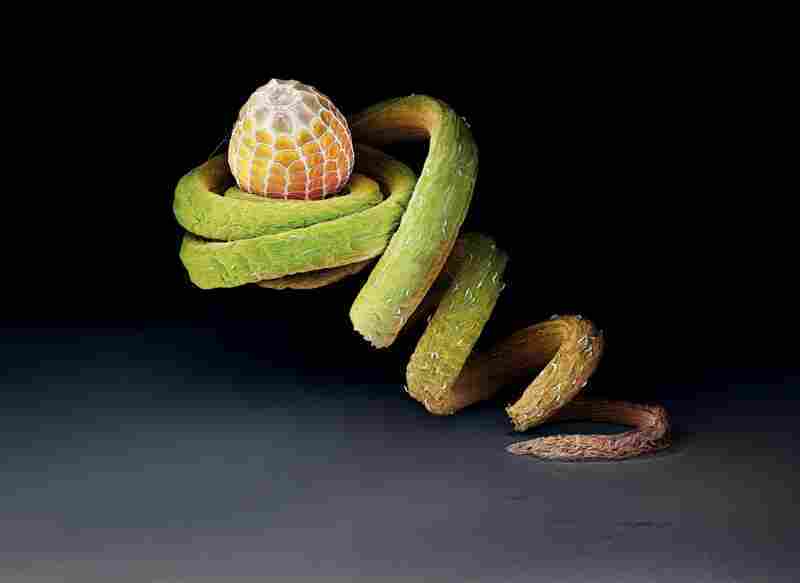 The orange hue of this zebra longwing butterfly egg is a warning to predators. The egg contains cyanide and other toxins. The Adonis blue butterfly lays its eggs only on horseshoe vetch, a flowering plant. 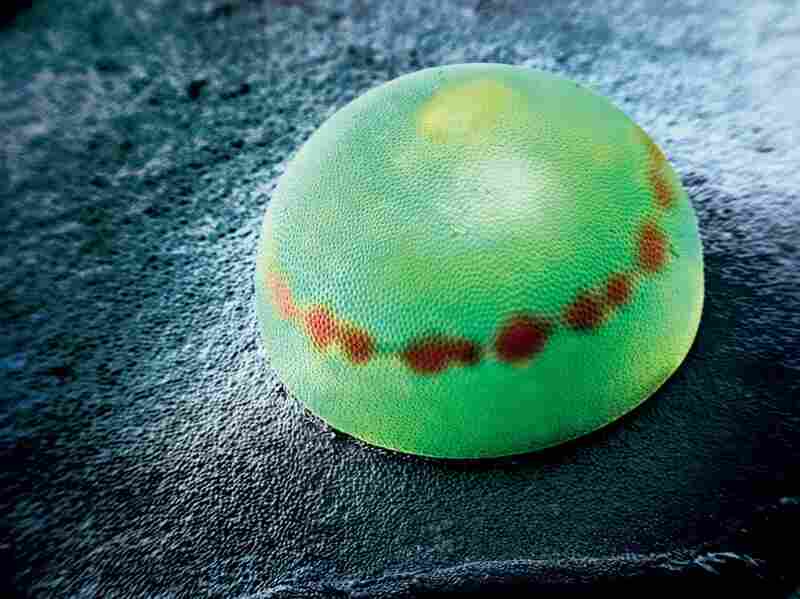 Inside this egg is a blue morpho, one of the world's largest butterflies, with a wingspan of 5 to 8 inches. The red band results from a chemical reaction after fertilization. Oeggerli is as much a scientist as he is a photographer. His "camera" is actually a scanning electron microscope; and in addition to a Ph.D., he has an inordinate amount of patience. One of these images could easily take a week to create. As he explains, it takes about a day to position the object (an insect egg in this case), a day to scan the image pixel by pixel, and nearly 40 hours to manually color the black-and-white scan. The finished product is so spectacular that you might forget what you're looking at. That's where the article text comes in. 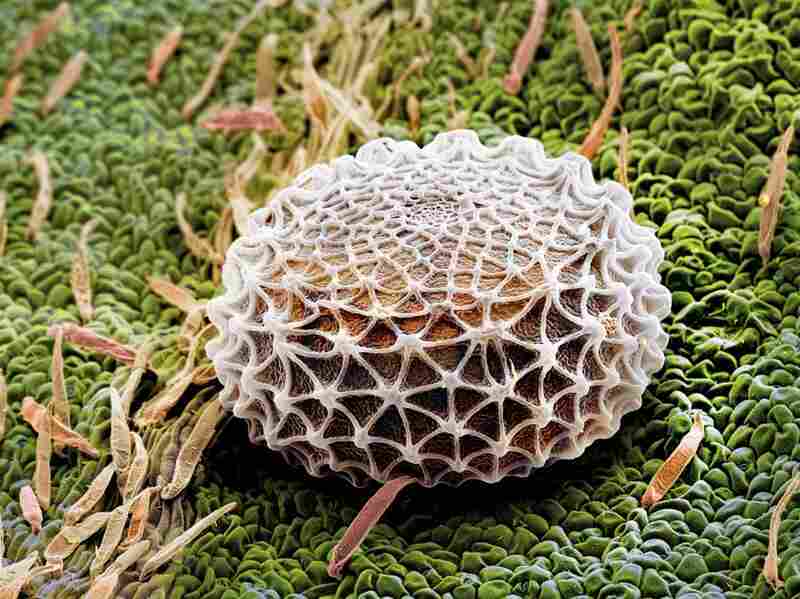 Although completely reverent, ecologist Robb Dunn won't let you forget that these are insect eggs. In one case, he describes "paraditoid" wasps and flies, which "use their long ovipositors to thrust their eggs into the the eggs and bodies of other insects." I'm sorry. I don't care how pretty the photos are — that's just gross. Check out more of Oeggerli's microscopy on his website. Also, if you like bugs and microscopy, look at this.